Black drum is the largest member of the drum family, Sciaenidae, and can be found along inshore waters and estuaries from Argentina to the Gulf of Mexico. They also occur throughout the east coast from Florida to New England; however, they are most commonly found from the Chesapeake Bay south. The largest numbers occur along the Texas coast in Corpus Christi Bay and Laguna Madre. Black drum are gray or black colored with a high arched back. They get their common name from a large and elaborate swim bladder that, by using special muscles, can resonate to produce croaking or drumming sounds. These fish have 10-14 sensory chin barbels that they use to detect bottom-dwelling food items such as clams, oysters, mussels, and crabs. They can crush these items by using their cobblestone-like teeth, or pharyngeal tooth plates. Black drum are long-lived, with fish from age 7 to 57 years old observed in Chesapeake Bay. Black drum spawn at the mouth of Chesapeake Bay and seaside inlets of the Eastern Shore between April and early June when water temperatures reach 57-68o F. Mature fish may contain over 30 million eggs. After spawning, black drum spread out within the Bay and will migrate southward in late fall. Juveniles, usually distinguished from adults by their 4-6 vertical bars, prefer shallow, nutrient-rich waters typical of tidal estuary habitat. Young-of-the-year black drum will remain in this environment until they reach approximately 2½ inches, when some will move to deeper Bay water. Tagging results from the Gulf coast show limited black drum movement during their first three years of life. 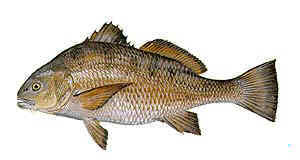 It is believed that young black drum migrate from estuarine habitat to offshore habitat at age four along the Texas coast, when they are sexually mature. These mature adults return to estuarine habitats only for spawning. The Chesapeake Bay Black Drum Fishery Management Plan (FMP) was adopted in 1993 and it includes various management strategies and actions to protect and enhance the stocks of black drum utilizing Chesapeake Bay. They include: 1) promoting research on characterizing the biological components of the black drum population; 2) monitoring the commercial and recreational harvest of black drum and adopting regulations to stabilize harvest; 3) designating high use areas, in time and space, during black drum season for rod and reel angling only; 4) continuing to promote the commitments of the 1987 Chesapeake Bay Agreement and the 1992 Amendments. The achievement of the Bay commitments will lead to improved water quality and enhanced biological production. After the adoption of this FMP, Maryland implemented tagging efforts to learn more about black drum migrations, habitat preferences, and seasonal distribution. From 1996-1998, Maryland's Department of Natural Resources (MDNR) purchased black drum from commercial pound net fishermen, which were subsequently tagged and released. Fish that were available through this effort were large (36-50 inches). A total of 823 adult black drum were tagged and released. To date, there have been a total of 51 tags returned; 30 from commercial fishermen and 21 from recreational fishermen. Tagged fish have been recaptured in the same commercial pound nets they were tagged from and by recreational anglers as far away as Fernandina Beach, Florida. The last tag return received was 5-29-2003 from a drum tagged in June 1997. After six years the tag retention rate appears to be good so we may see additional returns in years to come. Stock status of black drum is unknown, but the extended size and age distribution of black drum bought from pound netters indicates overfishing in the Bay is unlikely. No management plans or other source documents exist for Atlantic coast black drum. Much of the information regarding black drum has been derived from work along the Gulf coast. Current evidence indicates that separate Gulf coast and Atlantic coast stocks may exist. In March 1999, Maryland DNR banned the commercial catch and sale of black drum in the Chesapeake Bay and its tributaries. A quota of 3000 pounds was set for Maryland’s Atlantic Coast. This quota has since been reduced to 1500 pounds. The recreational season for catching black drum is of short duration. It is an intense four to six week fishery in late April to early June and is usually concentrated on and around the spawning grounds west of Cape Charles. Fishing in Maryland has issued citations annually for recreationally caught (charter and private catches) black drum 40 pounds or larger since the early 1960s. During 1986-1996, the number of citations issued ranged from 11 to 36. During 1993-1996, charterboat harvest ranged from 18,000 to 43,000 pounds and averaged 31,200 pounds.